So, last week, the Chiefs started off well. They jumped out to a 38-10 lead at the start of the third, even though Jamaal Charles, who was their entire offense all year, at the beginning of the game. But, all of a sudden, their offense stalled, and were only able to muster two field goals for the rest of the game. Early in the fourth, they lost their second string running back, and the guy who won me my fantasy league, Knile Davis, and the offense stalled. I'm not saying that Charles is replaceable, but Davis was certainly able to mask Kansas City's deficiencies pretty well. The drop off from him to Cyrus Gray was awful, and spelled doom for the Chiefs, especially since they had already lost WR Donnie Avery, and CB Brandon Flowers for the game. That game also illustrated the inconsistency of the Colts, who started off horribly, allowing all sorts of big plays down the field in the first half, but neutralized the deep passing game as the game went along. The same thing happened to their offense, they got a lot better in the second half. It's hard to explain this, and it makes the Colts an almost impossible team to forecast. While I predicted the Chiefs to win, my pick was still right, as they covered the spread by half a point. Yeah, I know, I got lucky. I'll take it. As for the next game, my loss was also pretty reasonable. The Saints played better defense than I expected, which I considered a possibility. Oh well. I'll get back to the Chargers-Bengals game. The Niners-Packers game went almost exactly as I thought it would. I had the score as 24-20, so I was just a single point off the actual final. It was a great game to watch. Okay, now, it's time. What the hell Cincinnati? They saved their worst game of the season for last week. Yeah, the Chargers defense played a lot better than it had for most of the year, but that's not why they won. There were so many stupid offensive mistakes, and that's so inexcusable. I can't believe what I saw. I do still believe that they are the better team, and, 9 out of 10 times, they would have won that game. I do still believe that Andy Dalton can be a Super Bowl quarterback. Obviously, he's not ideal, and it;s up to the Bengals to try to find a better option than him, but, for now, if he's their leader, they're fine. He can win in the playoffs. That game was an anomaly. And a disgusting anomaly at that. So, now, it's time for this week's picks. UPSET ALERT next to games in which I think the underdog will win outright, not just cover. Home team in CAPS. Saints (+9.5) over SEAHAWKS. With the Saints defense coming off a nice showing on the road in Philadelphia, this particular game is harder to predict. It's certainly possible that New Orleans can win, but, I'm going to have to go with the Seahawks. The question is, by how much? With Percy Harvin slated to return, it should be interesting to see his usage in this contest. During the regular season, he only played one game, and he obviously wasn't ready to go. If he's anywhere near full strength, then the Seahawks officially have no weaknesses. They're so good everywhere else, but, with Doug Baldwin and Golden Tate carrying the load at the wide receiver position, it's simple to see why Harvin would make such an impact. As for the Saints, the offense needs to be completely on point for them to win. Specifically, the running game has to be able to move the ball. Seattle's pass defense is by far the best in the league, and while their rest defense is still seventh, the way to beat them is on the ground. And, without Pierre Thomas, I don't think the Saints will be able to do that. The reason why I picked them to cover, is because, why would I ever pick Drew Brees to lose by 10 points? Really, would you ever do that? Colts (+7.5) over PATRIOTS. Despite being wildly inconsistent, the Colts are probably the better team here. After losing key players via injury all throughout the year, the Pats have hobbled into the playoffs. For whatever reason, LeGarrette Blount is playing pretty well since taking over the starting role from Bill Belichick's least favorite person, Stevan Ridley. And, it is possible to run over the Colts. Now, here when it gets interesting. As we saw last week, even Alex Smith can throw all over the Colts secondary. So, what am I thinking? Is Tom Brady not at least 2 points better than Alex Smith? He is, but his weapons may actually be worse than those on the Chiefs. Yeah, Julian Edelman is going to catch a ton of short passes, but there's not much else for Brady to throw to. Throwing it over the top to Kenbrell Thompkins and Danny Amendola, who just doesn't look like the same player anymore. Trust me, this is not because I think the Colts secondary is any good, but, rather, an indictment on the Pats. The defensive advantage that the Colts have is Robert Mathis. He's playing out of his mind right now, and it will be hard for the Patriots to stop him with Logan Mankins hobbled, and Sebastian Vollmer on IR. On the offensive side of the ball, the Colts will score a lot of points because the Patriots defense is pretty bad, and, well, Andrew Luck. 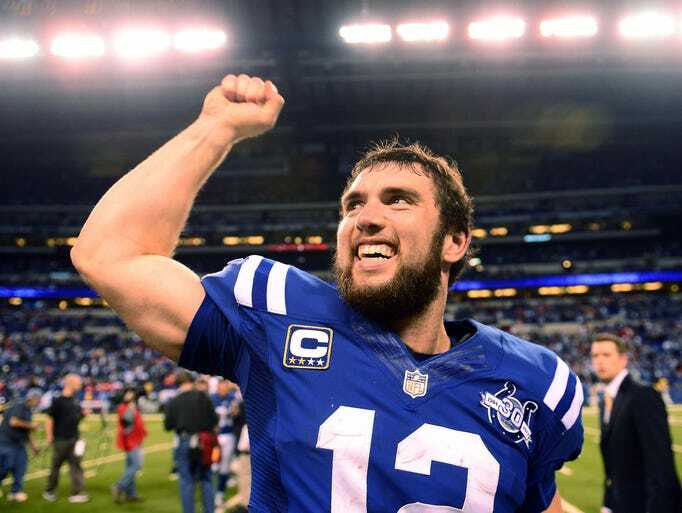 And unlike Brady, Luck has T.Y. Hilton to throw to, which is a huge advantage. He has the ability to catch not only short passes, but take the top off the defense and make huge plays. He'll be a tough matchup this week. Overall, this game is being played between two teams that don't have much going for them on the defensive side of the ball. But, at this point, the Colts have a better offense, which will mean that Andrew Luck should lead his team to another shootout victory. 49ers (-1) over PANTHERS. I've had a lot of trouble with this game. These two teams are built just like one another, except that the Niners are better at it at almost every position. So, why is this such a tough call for me? Well, there are two reasons. First of all, the Panthers are playing at home, and they already beat the Niners in San Francisco. And, of course, Cam Newton. As much as I love Colin Kaepernick, I think Cam Newton is better. In fact, I think Newton is the best young quarterback in the league; which makes him better than Kaepernick, Andrew Luck, and Russell Wilson. The man makes plays. No matter what the situation is, he makes plays, all the time. He's one of the scariest offensive weapons in the league. He's done so much with only a shell of Steve Smith, Deangelo Williams, who is about average, and a bunch of nothing around him. However, I'm sticking with the 49ers because they are simply better than the Panthers everywhere else, and the drop off from Newton to Kaepernick isn't that bad. Even though "Kraken," Greg Hardy has been absolutely ridiculous this year, Aldon Smith has the capability to be just as great as Hardy has all year. This should be a fun game to watch, and really, either team could win, and it wouldn't surprise me. But, I have to stick with the 49ers. I hate having to pick this game, but, there you go. Chargers (+9) over BRONCOS. The Chargers are apparently supposed to be the Cinderella team for this year. Look, they played really well last week, but I just don't see it happening against the Broncos. Now, it would make sense for the Chargers to win, because they have been a bad matchup for the Broncos in their two games, even beating the Broncos in Denver. I get it. In fact, that's why I'm saying that San Diego will cover the spread, because they are getting a lot of points. But, despite all the narratives about Peyton Manning in the playoffs and in cold weather, I can't pick against him. Especially not this season, when he has all these weapons at his disposal. Whatever, call me crazy, but I'm sticking with Peyton Manning in, much like the other AFC game, a shootout.